Engineered Material Systems, Inc. (EMS), a leading global supplier of conductive interconnect materials for photovoltaic applications, announces plans to exhibit at EU PVSEC, scheduled to take place Sept. 25-28, 2018 in Brussels, Belgium. The company will showcase next-generation low cost conductive adhesives for stringing, shingling and back contact applications in crystalline silicon and heterojunction solar modules in Booth D2. 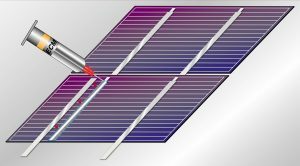 The EMS line of electrically conductive adhesives contains low cost products specifically formulated to meet the process and reliability criteria required for each solar module format. Materials designed for stringing and shingling are very flexible, and will snap cure and fixture cells and ribbons in seconds at 150°C with enough strength to withstand module manufacturing processes. The adhesive cure is completed during the encapsulant lamination process. EMS materials designed for back contact applications are very flexible and cure during the encapsulant lamination process. Materials also are available with different rheologies for different dispensing techniques: Lower viscosity (screen printing or jetting), medium viscosity (needle dispensing) and high viscosity (stencil printing). Electrically conductive adhesives are more stress absorbing than solder to withstand the rigors of thermal cycling and process at lower temperatures. EMS conductive adhesives are less than a third of the cost of pure silver-filled conductive adhesives. For more information about EMS’ low cost conductive adhesives or to learn how the company can define, develop and create an engineered material solution that is right for your company, visit our tabletop display at the conference or visit www.emsadhesives.com. SMS Electronics strives to make the entire electronics design, development and distribution process smart and simple for customers.